More varied in its offerings, but also more disjointed than her previous work, Red sounds like a transitional album for Taylor Swift, as her musical profile undergoes a modern-rock makeover. You can make a strong case that the secret to Taylor Swift’s unparalleled success has come from her ability to control her musical identity as well as any other in-their-prime artist. Focusing on developing her craft ever since she hit the scene in her teens, Swift has always possessed the skills and an ethic that belie her age, coming off like an old hand in her music even when her subject matter was young adult. So instead of worrying about keeping up with her peer group, Swift seemed like she kept her eyes on the prize for the long run, rather than simply cashing out for short-term gain. In the end, she’s gotten her cake and eaten it too, since not only has Swift been able to build her reputation as an honest-to-goodness songwriter to the broadest audience possible, but she's also leapfrogged the Hannah Montanas of the world in notoriety and trendsetting. As a result, the shrewd choices she’s made in prioritizing her music and generally doing the right things the right way have made her a sympathetic and admired public figure, her real-life popularity lending credibility to the heroines of her songs, even when they’ve been wronged no more than they’ve done the wronging. After all, Swift’s no less snarky than the petty girls she dings when she gets the last word in on “Mean”, nor is she just the aggrieved party on “You Belong to Me”, which is as much about getting the dreamy boy as it is about one-upping the cooler girl. And as for all the guys she disses and dishes on, it’s definitely easier to side with Swift, even though you have to keep in mind her little black book is probably just as big as the lotharios she’s shaming. By defining herself as an artist first and foremost, Swift has been able to shape and manage her image as well as anyone in such a glaring spotlight has, cast -- whether by herself or everyone else -- as America’s sweetheart even as she airs her dirty laundry in more public a way than most. On her fourth album Red, however, Swift encounters something she has yet to in her career, going through, at least musically speaking, the growing pains you'd thought she’d gotten past because she never seemed to have them in the first place. More varied in its offerings, but also more disjointed than her previous work, Red sounds like a transitional album for Swift, her musical profile in the process of undergoing a makeover rather than coming off as the finished product it usually does. Releasing the teenybopper insta-hit “We Are Never Ever Getting Back Together” as the lead single signaled that change in an all-too-blatant way, as drastic a departure from her familiar country-ish stylings as she could possibly have made. While ears have probably grown accustomed to the head-scratching first impression “Never Ever” made when it first flooded the airwaves a few months ago, the collaboration with Swedish hitmaker Max Martin still seems like a puzzling move, its mass-produced tech-pop pandering to a tween audience that Swift had already conquered on her own terms. Even more perplexing than “Never Ever” is what Swift describes as her foray into dubstep on another Martin production “I Knew You Were Trouble”, a trainwreck of styles with her strummy guitar layered on top of too-brash synths and overly crisp rhythms that may or may not approximate dubstep. The real upshot of both pieces is that it feels like Swift is chasing after what’s trending rather than following her own intuition and setting the pace for the first time in her career. The thing is, the actual, more convincing transition that Swift makes on Red is much less brazen and over-the-top, as she attempts to reinvent her country-pop as beefed-up modern rock. Indeed, the shift in the inflection of her sound is something you can’t help to notice right at the top of the album with the opener “State of Grace”, a muscular arena-pop number that chugs along to gleaming guitars that split the difference between Swift’s earlier anthems and radio-friendly alt-rock, and the title track, as its banjo picking works up to some power riffs. “All Too Well” is an even better example of how Swift has amped things up, combining the kind of drama that has come natural to her songwriting with a widescreen guitar-driven approach. And if there’s any doubt that Swift was trying to horn in on Coldplay territory, consider “The Last Time”, not simply because it’s co-written with Snow Patrol’s Gary Lightbody, but more because it’s a brooding romance that’s shrouded in atmospheric feedback and moody emoting. But even with all the changes in her musical outlook, Swift’s innate strengths as a songwriter still ring true in the way her storytelling uses fine-grained touches to make her individual experiences feel universal -- if anything, that ability is all the more striking when compared to the clichéd vocals that are par for the course for mainstreamed alt-esque rock. For instance, the anthemic scale of “All Too Well” doesn’t overwhelm or obscure Swift’s eagle-eye for poignant scenes and vivid images, like the way the cold air of an empty house, a lost scarf buried in a drawer, and stolen glances at a traffic light tell the tale here. On the regret-tinged L.A. story of “The Lucky One”, she gives you an idea of what Best Coast’s Bethany Cosentino would be like if she paid more attention to detail both musically and lyrically, as Swift meditates on how fleeting fame is and lets you envision it in her own shoes: “And they tell you that you’re lucky but you’re so confused / Cause you don’t feel pretty, you just feel used / And all the young things line up to take your place.” And while the breakneck ditty “Holy Ground” works just fine as a peppy three-minute pop-rock song, Swift has a knack of giving you a mental picture that makes the feelings her music evokes come through even more strongly, as she blissfully sings, “Spinning like a girl in a brand new dress, we had this big wide city all to ourselves.” While her contemporaries are willing to settle for more generic love song lines, what sets Swift apart is her version of the story, at its best, builds a narrative and fills in the specifics. 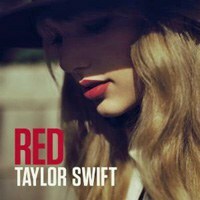 At 16 songs long, Red could use more editing and streamlining with a less-is-more mindset as a guiding principle, particularly since the quieter numbers -- which also happen to be some of the album’s strongest moments -- get lost in the sound and fury of Swift’s grand gestures. So while the whispered melody of “Sad Beautiful Tragic” lives up to its name and the pretty “I Always Do” is a big-hearted, soft-spoken ballad, there’s not as much room on Red’s crowded tracklist for them to shine like they should. Still, you can’t blame Swift for indulging her unbridled ambition and overactive imagination, especially considering she has the means to do so. Ultimately, Red might be about getting a few things out of Swift’s system in order to figure out where she’s headed. If that’s the case, the title of Red’s patient, pitch-perfect closing number might be even more auspicious in predicting what’s yet to come for Taylor Swift than in describing what’s happening this time around: “Begin Again”.